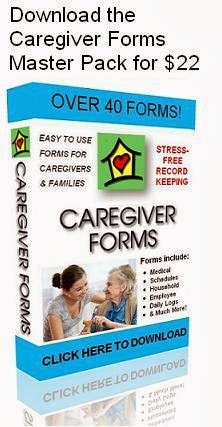 The Caregiver Forms Menu Planner is easily used when your client or loved one is on a special diet because it includes two snacks a day. This planner is especially helpful if your loved one is on medications that need to be taken with food or at certain times. With the shopping list at the end of each day, you can be ready to shop when you finish you plan and not wonder if you are missing something. Use this menu planner and alleviates the stress of last-minute meals. Different versions of the menu planner can be found in the Caregiver Forms Master Pack.